Should white oil fail to do the job, I . . . I don't know. I don't know what to do. I mean, yes, it's very much like #005 "Chad Michaels," but I like Chad a lot, so that's fine with me. As it did with Chad, my camera understates how dark the spathe is. The plant as a whole is actually pretty nice, though I don't have any photos that show that very well. 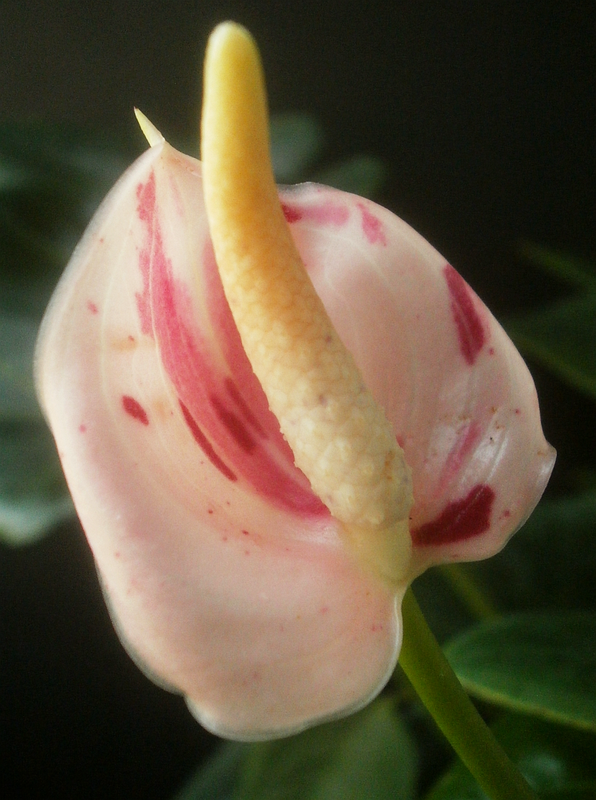 I was not expecting the purple spadix, so I guess that's something to be pleased about. 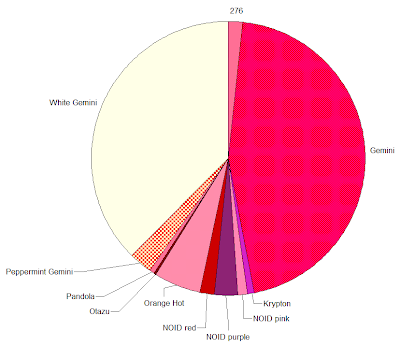 This probably also means that Noah is 'White Gemini' x NOID purple. That NOID purple sure got around. 'Pandola' and the NOID red are probably much better represented on the pollen-parent side of things, but several of my stock plants appear to have made no contribution at all to the seedling-genetics situation.7 Which I suppose makes it all the more impressive that I've gotten the sort of color range out of the seedlings that I have. You may also notice from that pie chart that the second generation is officially upon us now. Eight of the seedlings have #276 "Zach Religious" as a seed parent. They aren't yet old enough to be doing anything interesting, and won't be for some time, but they exist, and seem content not to die, which is all I ask for at the moment. Left column, top to bottom: #636 "Lourdes Prayer," #637 "Abby Damned,"
#638 "Rosetta Stoned," #639 "Vicky Tacky." Right column, top to bottom: #640 "Penny Tration," #641 "Ciara Mist,"
Seeds from #271 "Wanda Reulthemal" and #234 "Ross Koz" have also been sown, though none of those are big enough to pot up yet, and it's beginning to look like there may be something wrong with the one seed of Ross's so I'm not getting my hopes up. (He has others. It'll be fine.) Another four plants9 are very close to having mature berries, so there will probably be some seedlings from those potted up too, by maybe December. 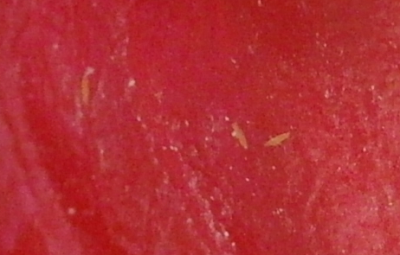 1 There are three scale insects visible in the photo. Can you find all three? 2 Vegetable oil, dishwashing liquid, and water, mixed together. The recipe I intend to follow calls for a 4:1 mix of oil and dishwashing liquid, mixed up, and then diluted to 4 Tbsp of that mix in a gallon of water. Which doesn't seem like it could possibly be enough oil to accomplish anything, but that's the recipe I found, so that's what I intend to try. 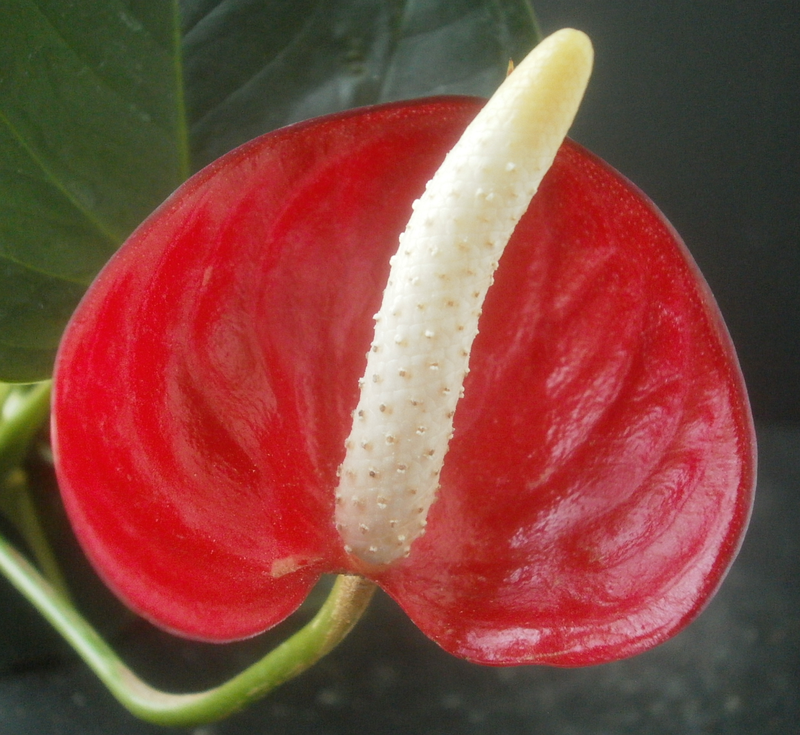 4 According to the Anthurium-breeding book, blooms emerge from the leaf axils. If a bud aborts, then, you usually have to wait for the plant to produce a new leaf, a process which takes about a month, before you can see the next one. For the most part, this matches my observations, but Ivy and a few other seedlings seem to have found a loophole, possibly by switching to the axil for an older leaf, being faster to construct leaves than I anticipated, or producing a leaf while I was distracted by something else. 5 Technically, I don't know for sure that this is 'Peppermint Gemini,' as it wasn't tagged when I bought it, but it did say it was produced by Twyford, and it's the only speckled white/red/pink variety of theirs that I know about, so it seems safe to assume, at least provisionally. 6 There are already 13 seedlings with 'Peppermint Gemini' as the seed parent, three from 21 September 2013, and ten from 19 February 2014. So it's going to be a while before I find out whether speckling acts like the book says it does. And even if it does act like the book says, the book also says that when crossing a speckled plant with a non-speckled plant, even if the offspring are speckled, the speckles are usually coarser and less evenly-distributed than in the parent. There has to be some environmental component there, though, because the first bloom I saw on this plant had color a lot more broken up than this; see this post. 7 Specifically, there's been no confirmed contribution from 'Florida,' 'Midori,' 'Red Hot,' 'Joli,' or the NOID red-purple which may be 'Krypton.' ('Krypton' itself has gotten involved, though.) The last three of those have either killed off the developing berries before they matured, or haven't rebloomed for me yet. I've tried to pollinate 'Midori' and 'Florida,' and the spadices of both have changed, but there's no definite sign that either one intends to produce berries. 8 The only names I might take credit for are "Lourdes Prayer" and "Vicky Tacky," which I'm pretty sure I came up with. ("Lourdes Prayer" is not that great, but I'm pleased with Vicky.) All the others came from somewhere on-line. I linked the names I know to belong to actual drag queens; the others may or may not refer to anyone real. It's not like there's an official registry somewhere. Though the site that "Ciara Mist" links to seems to be trying pretty hard to be an official drag registration site. Every year, I think okay, this is the year when I will pay attention to the smells and try to record which flowers have them and which ones don't, and every year, I manage to remember one or two of them, because by the time I'm at the show and remember that I was going to try to keep track of that, I realize that I don't actually have a way of recording that so that I'll remember it, and then there's still the drive back home, and sometimes a trip to Home Depot, and then the uploading of the photos, by which point I've forgotten most of what I'd managed to try to keep in mind about the whole olfactory experience. Maxillaria tenuifolia got remembered this year because we've seen it before (previously: 2012), and readers left smell-related comments then, so when I saw it again, it was like oh, right, this is supposed to smell like coconut or something. Which I guess it kind of did, but it wasn't as close to coconut as I had imagined it might be. It's possible that some of that is explainable by interference from other scented things -- the venue itself is a garden center, and smells like one, and then there are multiple fragrant orchids around, plus lots of people who may or may not have their own odors, and the aroma situation inevitably winds up in an awfully complicated place. In any case, definitely scented. 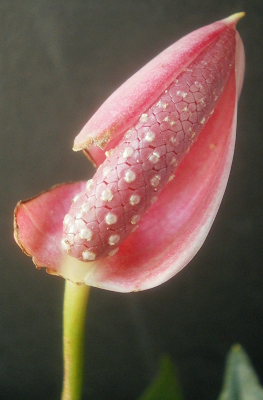 And weird-looking besides, both the plant and the flower. (It may help to view the full-sized image.) Seems nice enough. 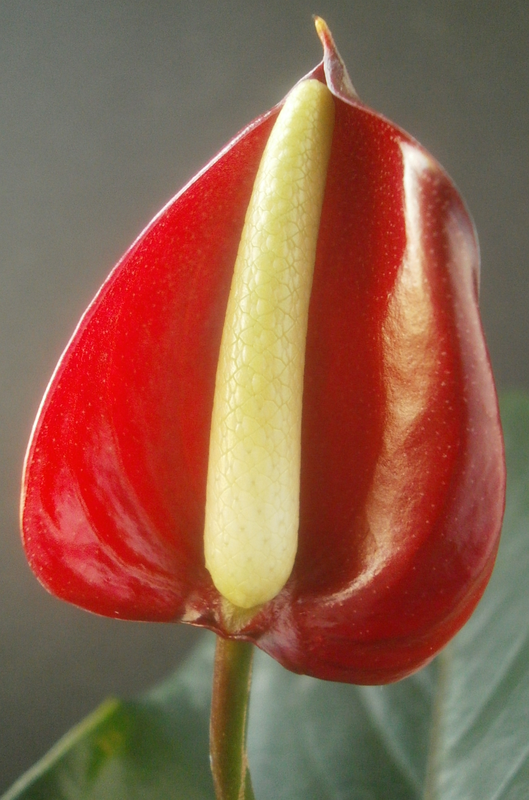 I'm not hinting for someone to send me one, and getting one's not high on my list of priorities, but if I someday wind up in a situation where I come across an available M. tenuifolia, you know, maybe I'll take it. 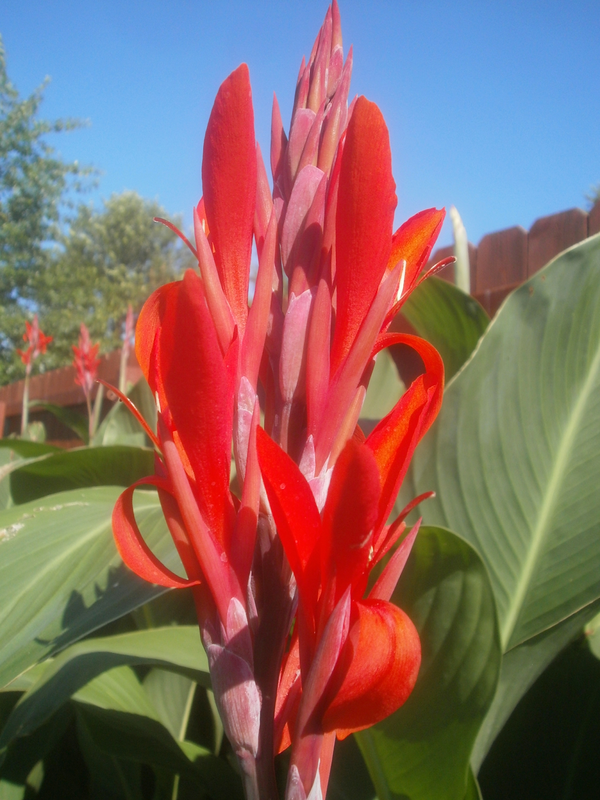 It doesn't feel like it could possibly be Canna-blooming season again, and yet here we are. This picture's from July 9, but they look about the same now, except that one of them has shattered and died. 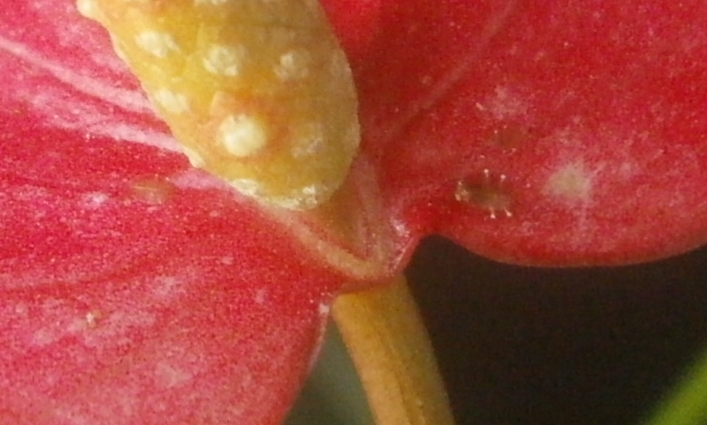 (It looked like something heavy fell squarely on the center of the plant.) I am choosing to believe that this was a case of Sheba running over it while chasing a tennis ball, instead of a mowing accident, which I can do because I didn't see it happen and can consequently explain it to myself in whatever way causes me the least upset. Though the mowing thing is more likely. I have decided as of this year that it doesn't really make sense for me to try to overwinter the Salvia elegans indoors anymore, and I'm going to stop trying. It's not that it's hard exactly; the problem is more that the cuttings outgrow their containers so quickly that I wind up having to take three or four rounds of cuttings in the course of a winter. Which is nice, in that I start with one plant and wind up with twenty-five, but they also always get spider mites in early/mid spring, regardless of where I have them in the house, which means a few weeks of worry about that, plus all the time it takes to keep them watered, pruned, and propagating. I could just spend $4 at the garden center in February, propagate off that for a few weeks, and wind up in more or less the same situation by May, just without all the work. So that's what I'm going to try next year. Oh. Reading back over this, I realize I just kind of jumped topics without explanation. 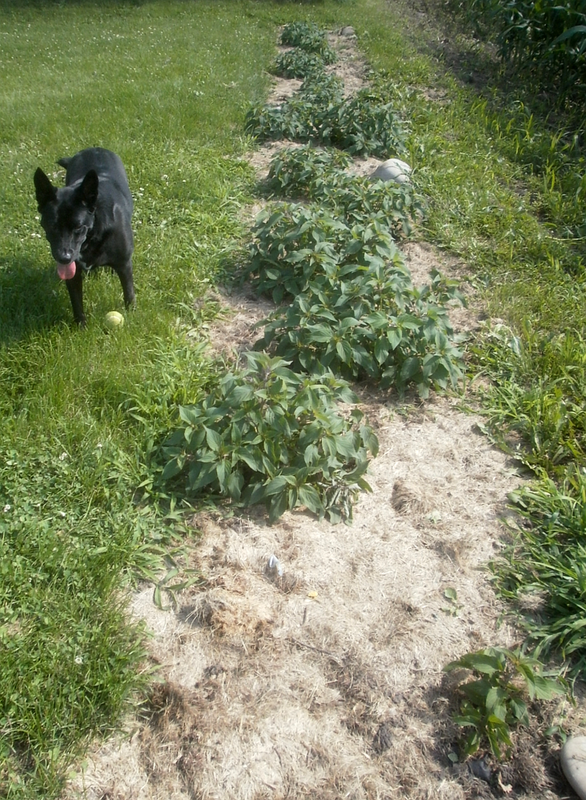 I went from hummingbirds to pineapple sage because the hummingbirds also like pineapple sage. Though my pineapple sage plants are going to have to grow quite a lot before September if they expect to be hummingbird-worthy. The hummingbirds have standards.